Lately I have found myself lecturing my kids about gratitude. Growing up significantly more privileged than I did, I can see how they feel entitled at times and forget how to appreciate the little things in life and take them for granted. Many times I see them upset if they can’t have something immediately or they play the victim card like the whole world is against them and life is so unfair. Sure, they are young and a part of this attitude stems from their immaturity, but I also see a huge opportunity for a shift in their mindset. The act of graciousness doesn’t only affect kids, it affects us all at any age. It’s funny because something so simple as being grateful should come easy, but sadly our minds and hearts aren’t wired to think this way. We have to practice it every day until it becomes habit. They say that when you practice gratitude and start seeing things in a more positive light your world changes. There are so many little ways we can practice gratitude on a daily basis so that they eventually become routine. While I can lecture my kids about being gracious until I am blue in the face, the best way to teach them is through example. I’ve been using the following tips to help me practice gratitude so that in turn that can reflect onto my kids. 1. Tell someone you love them and how much you appreciate them. 2. Smile, it’s hard to smile at someone and not get one back in return. 3. Include an act of kindness each day. 4. Don’t gossip or speak bad of anyone, only negativity can come from this. 5. When you think of a negative thought, try to see the silver lining in the situation. 6. If someone does something nice for you, return the kind act. 7. Say thank you for the little things people do for you. 8. Call your mom often. 9. Focus on your strengths. 10. Give a compliment to someone and make their day. It’ll end up making you feel happy too. 11. Keep a gratitude journal. Sounds silly, but once you start taking note of things you are grateful for, it will train your brain to see those things immediately instead of searching for them. 12. Turn everything into a gift, like your smile, laughter, they are all gifts. 13. Share a positive thought on social media. 14. Donate your time or money to a charity or a cause you believe in. Being grateful will put things into perspective so that when you see the good in a bad situation you don’t complain as much (if at all). It also will help you realize what you are blessed with instead of seeing what you think is missing. In essence practicing a life of gratitude will make you happier in general and improve your relationships, productivity, health, and stress. 1. To be alive, when you think about the opportunities and adventures that still await you, life looks pretty darn good! 2. My Nespresso machine (on sale for 40% off) because I look forward to that morning cup every single day. 3. Sponsored posts because that means brands respect me, trust me, and value the hard work I put into creating content and they’re willing to pay me for it! 4. YouTube because it literally saved me hours when assembling my daughter’s bike (lifesaver)! 5. Weekends because that’s when I get to “sleep in” (at least till 8AM). 6. Good hair days because nothing makes you feel like a million bucks than a gorgeous head of hair (well, maybe some killer heels). 7. Friends who’ve seen you without makeup and you’ve tooted in front of and still love you for who you are. 8. Freshly laundered sheets and blankets because I love to roll my face in them. 9. Avocado toast…it just never gets old for me. 10. My loyal followers – yes, YOU! I just got my Fohr Card follower quality rating score and it proves that all my hard work is paying off thanks to YOU! I received a 97% which shows that my followers are authentic and brands that work with me know they are getting genuine support and quality. So THANK YOU to my 70K followers who have supported me on this journey. Without you, there would be no @dailykongfidence. The above are just a few things that I am grateful for. And every night at dinner, I started making my kids write down one thing they are grateful for in a gratitude journal. I also ask them to write one kind thing they did for someone else without being told. I am hoping that after we do this for a month, their mindset will shift to a more positive way of thinking and their gratefulness will be come a habit. I would love to hear some ways that you practice gratitude? I love your outfit and I am totally obsessed with those shorts since I have the same ones. I try to practice gratitude on a daily basis too and I love that you are instilling this value to your children because it’s extremely important. Hi Mariann, yay twinsies on these shorts. I have literally been wearing them nonstop! Glad that you practice daily gratitude…what are some of the things you do, I would love to hear! It is a STRUGGLE to teach these kiddos to be grateful and we practice very similar things at our house. Having an attitude of gratitude makes all the difference. So, when it is time for bed each night, we read a little and then we talk about the nice things we did and the nice things we want to do. For me, I tell Addison about the art of paying it forward- how one nice thing you do (a smile, a compliment) for someone might cause that person to do something nice and that is how kindness spreads. I honestly tell my daughter that one of our jobs as human beings is to look out for each other and help when we can. In the world of instant gratification and so much right at their fingertips, this might always be a work in progress. But we’ll get there mama and you are doing a FABULOUS job with your children! I love posts like this and I am grateful for YOU! Awww Michelle, YOU are a great mama! I love the things you teach Addison and I will also incorporate that into my daily review of gratitude with my kids. It truly is our job as humans to be helpful and kind to each other and pay if forward. Thank you for your tips! It can definitely be a challenge to practice gratitude regularly, but I love that you’re working to do it more often. You have shared so many amazing things to be thankful for, and a lot of them are the same as mine! We are certainly blessed, aren’t we? Gratitude is such a great attitude to have and I seriously begin each day thinking how blessed I am. I am glad that we share similar things to be grateful for Stephanie! I absolute love this post and your outfit. You are truly amazing and beautiful inside and outside. Thank you for sharing this babe. Hi Raysa! Thank you so much for your sweet words. Gratitude is something we all can use a lot more of right? These are great tips!! I’ve been doing a lot better on the personal ones, but I have a long way to go! You’ve got some great ones and I wish I could be as introspective as you are! It’s a great quality to have! Thank you Jordan! I see so much positivity in you and I know you lead a gracious life. I can tell by your posts and your vlogs. Kids definitely receive more than we did, more than I think they should to be honest and they’re not as appreciative as we were from my experience. I often struggle with these same concepts with my stepson. He feels entitled to things because he’s a kid and that’s just not a valid reason. When I have kids, I’m definitely going to start young with them and these concepts. It’s harder trying to implement these things with a teenager when he/she wasn’t brought up that way to begin with! I totally agree, it’s easier to train them young and have them practice the art of gratitude daily as children so that when they grow up it is just habit and ingrained in them. I know you will make a wonderful mother one day Candace! This is such a great post and it’s so fun to hear how you’re instilling this very important practice in your children! They are very lucky to have you as a role model : ). Even as adults, we can be impatient, entitled, and play the victim card – haha! Gratitude is so important and is a huge part of what keeps us grounded and positive. I’ve found myself turning to this more and more lately – meditating, journaling, and exercise are my biggest relievers! They all play a different role in reminding me to be grateful for my mind, my body, and the present. Thanks for writing this post! Thank you so much Amy! I definitely agree that gratitude helps us keep grounded and you have great tips for practicing gratitude as well. I think exercise is also a great one like you mentioned. Feeling healthy and strong helps us appreciate life and our bodies. xoxo! First of all your outfit rocks! And most of all thank you so much for this post. It brings you back to reality because I think we all become complacent and are not appreciative of so many things. I am so grateful for my life right now. There are so many positive things going on. I am getting ready to graduate and are heading to my number one choice of college in the fall. For me that is what I am so grateful for. I am making a copy of all your points so I can remind myself from time to time. Thank you – I am so grateful for this post. How exciting for you Gracie! Where are you off to college – I think you mentioned CA before…You have so much going on and I love that you are appreciative of it all. I like that you shared some positive things going on in your life. That also helps others realize the positive things happening in their lives too! Thank you Karen, I appreciate you stopping by! I love the message of this post. I myself can attest to the wonderful feeling I get when I practice gratitude into my everyday activities. I started a gratitude journal a few months ago after finding myself becoming so stressed with my heavy workload. It really worked to refocus my mind on the positive and I felt much better. It’s wonderful your instilling this life lesson early in your kids. Thank you Jo. It’s amazing that you have kept a gratitude journal and can refer to it when you feel overburdened. Thanks for this reminder of being grateful for each and every day I get to have here on earth with the ones I love most. Sometimes I get sidetracked when life gets hard or chaotic but this post was exactly what I needed today. I try to show my kids to be thankful for the little things (thanking God for a great parking spot or an easy drive to school and not being late) to big things like our safety, food, house to live in. I also am so thankful for the friends I have that support and love me through the good and the bad. You are definitely one that I am super thankful for bc without you, I’d be lost forever. Thanks for being a great friend to me even when I don’t deserve it. Love you! Awww Marie! You totally show gratitude all the time and I am grateful for such an incredible friend like you in my life! Yes, it’s the little things in life we often overlook and need to say how grateful we are for them out loud! It’s really a great post and delivered the best message. Thanks for sharing. Thank you Alena, I appreciate it. You are too sweet and I am grateful for your support and comments. Amazing look ! Very beautiful ! I started sharing three things each day that I was grateful for with my gratitude buddy. It really helped me to be in tune with what was going on with my own life and with my friend. Such an important thing to do! What I appreciate about this post is that you have said what you’re grateful for and so set the example for your children. For me, I think it is really important to write it down to remind yourself and then you can look over that list in years to come. Thanks for sharing! That is so true, I definitely think looking back and reading what you were grateful is also amazing! This is such a beautiful post babe. Not only your outfit (killer top btw) but your prose totally resonates since gratitude is something I practice daily. Yes, just like exercise you really have to psyche yourself up for the challenge, but with hard work and dedication all of a sudden it becomes second nature. I found you on IG when you had 30K followers (an achievement in itself) and to see the different brands you’ve been working with and how your style has evolved is inspiring! Not to mention caring for 3 little tots while you’re at it! You are SUPERWOMAN woman! Thank you for the blog visit babe, hope to see you back for my latest TRAVEL GUIDE: Japan in 10 days- The PERFECT itinerary for Japan first timers! Ahhh I totally needed this as a kind reminder! I feel like sometimes we get so wrapped up in everything and just life in general so it’s hard to realize we need to take a step back and just appreciate everything. I laughed at your gratitude to your Nespresso machine! I really want to get one myself hehe. Love this outfit <3 and yes girl, all your hard work IS paying off!!! Totally, we just need little reminders of what makes us happy. And yes, my Nespresso machine brings me such joy every single morning. You must get one! I completely agree with you on practicing a little gratitude and having recently come out of Australian Fashion Week I feel like our society is in DESPERATE need of this. They’re great tips on how to practice gratitude and I’m especially try to practice the act of giving compliments. I love this post! We often get so carried away with our busy lives and we forget to be thankful. To thank yourselves, our loved ones, people who have helped and inspired us, and just be grateful in general. Thanks for this little gratitude reminder post Christine. I have made a deal with myself after reading your post – I need to practice gratitude everyday before bed time. Just a list of little things I want to be grateful for throughout the day. Thanks for sharing this inspirational post! This top is gorgeous. 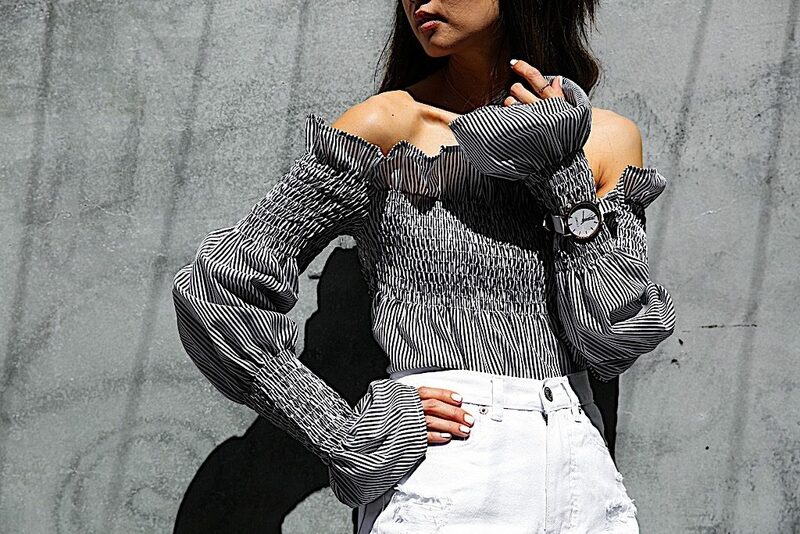 I love the fun statement sleeves! We always have to practice gratitude and love all your tips here babe!!! Definately something I always do is smile but I really have to put in practice all the rest more. On the other hand absolutely love your look the top is just adorable! Omg this is something that I always struggle with. This is such an important reminder for sure. It is incredible how our lives change when we are just a little bit more grateful. Thank you for sharing this! Also, loving the top soooooo much. Obsessed!